The Aviators is an award-winning weekly TV series featuring interesting people, the latest aircraft, the coolest technology and the best fly-in destinations. It’s action, intensity, and adrenalin mixed with education, entertainment, and beauty. The Aviators is for everyone who has ever gazed skyward. FLS Microjet: This spunky little jet weighs in at a mere 400 pounds! We profile this incredible (and tiny) aircraft and its full-sized pilot. SR-71: Blackbird pilot Terry Pappas tells us what its like to be one of just 478 people who have flown this stealthy Strategic Reconnaissance aircraft. Sean D. Tucker: We get to know the man behind the famous red Oracle plane and watch his death-defying aerobatics up close. Zenith 801: No runway? No problem! We challenge the limits faced in the world of bush flying in this amazing utilitarian aircraft. Legacy Flight: A tribute to our flying heroes, past and present. ILS Testing: The Instrument Landing System (ILS) is a precise system used to help planes land almost blind. We do some extreme flying in a CRJ-200 to test the system. Float Planes: An introduction to the world of seaplanes. Buying an Aircraft: Ever wondered how to actually buy an airplane? Aircraft Boneyard: With over 4,200 aircraft, sure the 309th Aerospace Maintenance and Regeneration Group (AMARG) is a “Boneyard” but it’s also so much more. Civil Air Patrol: We participate in a search and rescue exercise with CAP members and cadets. AWACS: We take an exclusive inside look at the Air Force’s eyes in the skies: the Airborne Warning and Control System (AWACS) E-3 Sentry. B-17: Kurtis looks at the historic Boeing B-17 Flying Fortress. Radial Engines: Anthony learns about the one-of a-kind sound and look of radial engines. Aerial Refueling: In-air refueling brings new meaning to the term “close flight” as we profile the KC-135 Stratotanker and its crew. Cobra: We take you aboard this two-bladed single engine attack helicopter formerly used by the United States Army. Team AeroDynamix: No other air show act in the world puts as many aircraft in the air at one time than Team AeroDynamix. We take you flying with them. Tank Killer: We profile the A-10 Thunderbolt II, the tank-killer more commonly known as the Warthog. Landings: Takeoffs are optional, but landings are mandatory! Kurtis takes a look at how to land different types of aircraft. Seabee: Is it a boat or is it a plane? It’s both! We show you the exciting world of Seabees. Varied Aviation Training: Short or long runways. Controlled or uncontrolled airports. Desert, mountain, or coastal flying. We look at the various ways and places you can learn to fly. GlasAir: We go flying in this blazingly fast low-wing, two-seat homebuilt aircraft. Legend Cub: The Cub is an aviators’ favorite and the Legend Cub is today’s most popular American-manufactured light sport aircraft. Terminals: How are airport terminals designed? We check out the form and function of terminals from the design of the arrivals and departures areas to how the gates arranged to park aircraft. Savannah: We profile this capable and affordable light sport homebuilt aircraft. Huey: A lot of people may recognize this helicopter from the film “Apocalypse Now”, but this bird has a lot more history than just that. Formation Flying: Kurtis expands his warbird flying experience and tries his hand at formation flying. How to Fly an ILS Approach: Kurtis shows you how to land an aircraft when you can’t see the ground using only your flight instruments. Airplane Parachutes: Can a parachute strapped to the back of an aircraft really save the lives of it passengers? 777-300ER: We examine the history and showcase the latest variant of the Boeing 777. Aircraft Mods: A look at how aerodynamic tweaks can improve performance and increase speed. Soaring: Anthony tries to keep his cool while flying without the reassuring sound of a roaring engine. F-4U Corsair: The WWII fighter made famous by the legendary Greg “Pappy” Boyington. Aerobatics: Kurtis receives an introduction to Aerobatics. We’ve seen him do a lot this season, but can he master this aviation skill? Goodyear Blimp: The Goodyear Blimp is an American icon. But Goodyear is at a transformational point in their history as they revamp the fleet to Zeppelins. 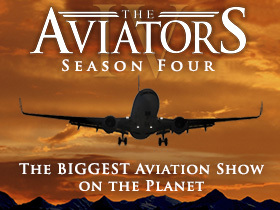 The Aviators airs on broadcast television with an estimated weekly US audience of over 9.3 million in almost 3.6 million TV households as reported by Nielsen during the show’s second season. In the United States, The Aviators has aired on almost 85% of public broadcasting stations across the country – numbers equaling PBS’ best network programs. Using the Listings Online service, fans seeking The Aviators can enter their ZIP codes on our website to find local air times. This service helps connect our fans to you. Episode feeds also include episode-specific promos that can be aired throughout the week to help make sure your viewers don’t miss the show. The series airs in Canada over a dozen times a week on Travel+Escape and is one of the network’s top rated shows. The Aviators is also an incredible international hit already airing in over 100 countries mainly on Discovery Channel. 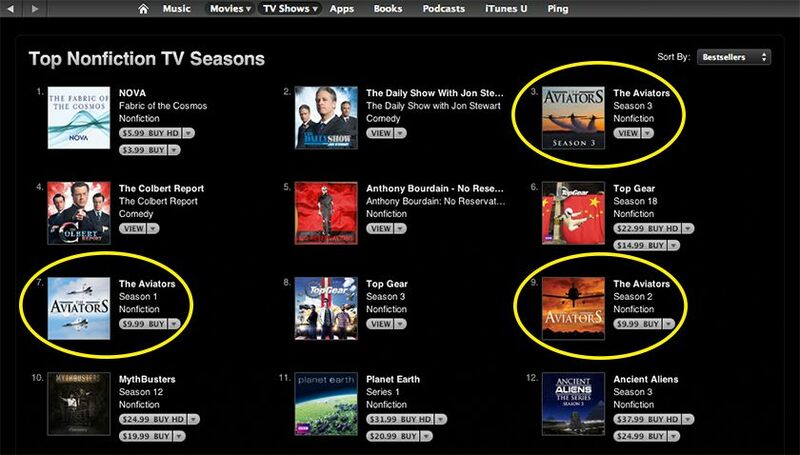 The first two seasons of The Aviators held positions in iTunes’ top 50 Non-Fiction TV Series right up to the premiere of season three on September 18th, 2012. The first episode of the third season skyrocketed up the charts eventually landing on the #3 position on the day of it’s release, immediately behind The Daily Show with Jon Stewart and ahead of titles like Top Gear, The Colbert Report, Anthony Bourdain: No Reservations, and Mythbusters. This meteoric rise carried with it seasons one and two which finished the day in positions #7 and #9 respectively, resulting in all three seasons of The Aviators ranked in the top 10 at the same time. Season 3 also broke the Top 50 chart of OVERALL television series’, ranking #46, in company with shows like Breaking Bad, Mad Men, The Office, Boardwalk Empire, Modern Family, and The Simpsons. Within just one week of the free-download release of the first episode of season 3 on iTunes it became the top All-Time Bestseller among free TV episodes. The popularity of The Aviators within and outside of public television is quite telling. Program distribution is reasonably close to population distribution when assessing metered public television markets. The numbers are exceptionally strong for both men and women aged 55 and above, considered to be the more “typical” public television viewers. However, favorable numbers exist in almost all age ranges. Furthermore, the incredible popularity of the show in new media indicates significant interest within the very appealing younger demographic showing a willingness to even pay to watch the show. Therefore, public television stations promoting The Aviators should be able to attract viewers of all ages. The Aviators is most commonly scheduled on Thursdays and Saturdays and during prime time. Statistics show a decline in overnight airings in favor of a move to early fringe. Many stations air episodes in multiple time slots throughout the week in which case overnight and early afternoon remain popular periods. Stations have enjoyed success running Aviators marathons and making complete season DVDs available for pledge. DVDs and Blu-ray Discs are available from Forest Incentives and Sound Media. Whether via pledge or by way of local underwriting, we are proud to deliver a show to our friends in public television that has unquestionably helped to generate millions of dollars in much needed contributions. We look forward to continuing our journey together as we get started on the production of season 5! I’ve been waiting on a show like this for years!